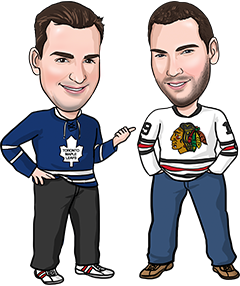 We went 2-0 last night with our NHL tips and are now 6-1 on our last 7 bets. It all sounds great, but remember that NHL betting, and sports betting in general, can be really streaky. There will be times when you feel you can’t lose, and there will be times when you feel you’ll never win another bet. We strongly recommend you make all your bets for approximately the same amount, whether you’re on a hot streak or you’re cold. Betting for profit is a marathon, not a sprint, and if you have more hot streaks than cold streaks in the long run, you’ll make money. On to tonight, where there are 8 games to bet on (2 games were played this afternoon and another was postponed). We have 3 official betting tips for tonight. We’ve also added a value play, one that we won’t count on our record win or lose, but just pointing out an underdog that might be worth betting on tonight. Blue Jackets are beat up, and we don’t just mean on the ice. They’re without Bobrovsky and will go with rookie Joonas Korpisalo in net tonight, but they’re also without coach Tortorella, who broke his ribs in practice yesterday. Sounds like there are a few distractions in Columbus these days. The Bruins lost Thursday to Vancouver and have been pretty critical of their play in that game. We expect Boston to bounce back tonight with an intense effort. The B’s are -200 favourites on the moneyline, so we’ll take them at -1 on the puck line instead at much better odds. 18 of Boston’s 24 wins have come by 2 goals or more, and Columbus has lost 21 of its 31 games by 2+ as well. If you can’t find Boston -1 at your sportsbook, you can split your bet between the moneyline and the -1.5 puck line, or you can take the Bruins to win in regulation time, which is almost the same bet. Both teams are slumping hard and it’s not easy to bet on either of them right now. So why are we betting on the Habs? Simply value. Jon’s a Leafs fan, but he’s not delusional enough to think Toronto’s close to as good a team as Montreal. Yet we get the Canadiens here at nearly even odds? Montreal’s going to turn things around at some point, and beating their biggest rivals on the road (like they did the Bruins on New Year’s Day) would be a nice start. It doesn’t hurt that Montreal’s won 8 straight meetings with the Leafs and 8 out of its last 10 at the Air Canada Centre. For whatever reason, Detroit can’t seem to win at home. They’re 11-9-3-2 there this year (which is basically 11-14), and they’ve dropped their last 4 games at the Joe. The Wings are also struggling to score goals. We were on them last night in Buffalo, but it took until 8 minutes remaining in the third for Detroit to score its first goal of the night. Anaheim isn’t an offensive juggernaut this year either, but the Ducks are playing great defense right now and are also showing signs of getting back to their old selves. Anaheim’s won 3 of 4 (the loss was to the Kings) and the team is rested, having its game against Washington last night postponed while the Wings had to play in Buffalo. Advantage Ducks. Bet this game at Sports Interaction – 100% instant cash bonus to $125! Like we said earlier, we won’t count this one on our record because we like to put out NHL tips we believe have a strong chance of winning. At +165 odds, though, the Avs don’t need to win this game even half the time in order to make this a great bet. +165 odds means there’s a 38% chance of Colorado winning, and we think the likelihood is more like 45%, so there’s a ton of value here. We’re not exactly sure that a 3-2 win at home over the Oilers Thursday means everything is right in Dallas again. The Stars had lost 4 in a row before that game, and they’ve still lost 7 of their last 9. Colorado, meanwhile, has won 7 of 10. The Avs are also 7-0 in their last seven versus Dallas, so they should be playing with confidence tonight. Let’s put it this way: We sure wouldn’t be taking Dallas -180 tonight. Good luck if you decide to play this one.